An excellent reference for Civil Defence uniforms is Air Raid Precautions Memorandum No. 17 1944. If you're getting into re-enacting Civil Defence service personnel from the second world war then a little research can save you both money and getting called out at an event by a stitch Nazi. What's a stitch Nazi? Well, there are a few re-enactors who take things a little too seriously. For them everything, and I mean EVERYTHING, has to be identical to that worn in the war... If you come across one, simply walk away. Some re-enactors portraying ARP wardens and civil defence personnel impressions are incorrectly wearing some post-war Civil Defence Corps (CDC) badges - it's easily done. They often look like war-time Civil Defence Service badges but were not available during the war. 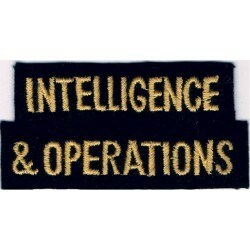 War-time insignia and badges used 'old gold' colour stitching; post war used yellow. An example below. 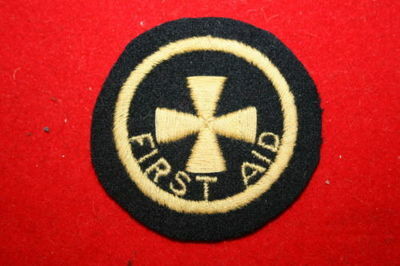 Colour difference between WW2 'old gold' colour stitching (Warden) and post-war Civil Defence Corps 'yellow' stitching (Ambulance). 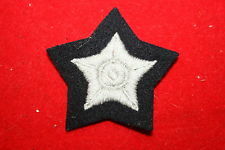 A couple of badges that regularly appear on uniforms are the circular FIRST AID badge on the lower sleeve and a white five-pointed star on a red and black star, the designation of a driver, both from the post-1949 period. There are also two 'bounty' stars - one in gold, one in grey/silver - that were also only awarded after WW2. There were also a number of distinct organisations within the CDC that did not exist during the second world war, for example the shoulder titles with WELFARE, HEADQUARTERS and INTELLIGENCE & OPERATIONS. I have seen no photographic evidence of these shoulder titles being worn in WW2 and they do not appear in any official lists. In addition, the small black CD and King's crown shoulder epaulette buttons were only found on post-war uniforms. During the second world war blouses were issued with plain black plastic, revolving shank buttons (often called bachelor buttons). Post-WW2 Civil Defence Corps profieciancy badge. With the reintroduction of the Civil Defence Corps during the Cold War, the dark blue uniform of battledress and trousers was maintained. There is no difference in the cut of the uniform but usually the uniform is more of a blue colour than wartime examples. However, many different manufacturers made WW2 uniforms and the shade of wool does vary. During the war, battledress blouses for women were not manufactured. Photographic evidence does show some ladies wearing men's battledress blouses but obviously the fit would not be ideal. As above the post-war blouses feature CD and crown black plastic shoulder buttons - these were not issued in the war. Wartime blouses had plain black revolving shank buttons. FARB - no one is quite surely of the derivation of this term but it has come to signify errors in uniforms and insignia on re-enactors uniforms and kit. Getting an impression spot on takes time, money and research. Everyone will make mistakes when starting out but many re-enactors are happy to share their experience and knowledge to help you get your look right. Nearly every person I've met has been a help (except a certain chap called Nathan I once unfortunately met at Chatham Dockyard who was a complete and utter knob of the highest order...).